Do you say yes to things when you mean no? Go ahead, admit it. You really wanna say no. So why don’t you? Why do you always say yes? Why do you say yes, when you really mean no? Well because we live in a society that prefers harmony over discord and confrontation. We are taught from a young age to fear being judged, rejected, or disliked. We are taught not to miss opportunities and always say yes to life. The trouble is, when you say yes you think you are avoiding negative feelings but what you’re doing is just trading one negative feeling for another. You start feeling frustrated that you accepted the invite. You start feeling resentful that you agreed to work late. You’ve traded FOMO for resentment and politeness for frustration. Worst of all, you aren’t honoring yourself because you aren’t being honest. What happens when you say yes instead of no? Well, we’ve already said above that saying yes, instead of no trades one negative emotion for another. But what else happens? Are there other detrimental effects? Yes, I’m so glad you asked! Revisit the first paragraph…. Do you feel the rushing, the anxiety, the stress? When you consistently say yes when you really mean no you might be over committing yourself. Women are the most guilty when it comes to an over burdened schedule. We say yes to all sorts of things to keep everyone balanced and happy. When you have too much on your plate how can you have time for children and family? When you over commit yourself you can’t have quality time with your significant other. You are very likely sacrificing emotional intimacy with your partner for the sake of being polite and agreeing to complete a task you probably don’t even want to do! Women are also the first to give up their self care to take care of others. It’s hard wired in to us from a young age. As a result you become over worked, tired, stressed, grouchy, and not very fun to be around. How can you be fully present and enjoy your life this way? When you say yes instead of no you aren’t setting effective boundaries with yourself or with others. People will learn that they can get you to do anything and they may even think they can walk all over you. Learn to set effective boundaries here. So how do you say no after a lifetime of saying yes? First of all, understand that saying no does not make you a bad person. You aren’t being rude, disrespectful, or selfish. These are old beliefs that no longer serve you. But where do they come from? We hold on to our childhood training and carry it in to adulthood. Let’s work together to get rid of this training! Second, know your value. You are a valuable person who’s worth does not come from the opinion of others rather it comes from within yourself. If you depend on other’s opinions of you for approval, validation, or self esteem you’ll never be happy or free. And you’ll for sure never set a boundary, either. Remember that you and your time are important and you aren’t valuing yourself when you consistently compromise yourself and your self care for the benefit of others. Third, ask yourself is it worth it. Is it worth saying yes? And I mean, Hell, Yes versus, no. If you aren’t chomping at the bit to say yes to whatever you are asked to do, or participate in, or attend then you better whip out that no. Think about the anguish, stress, and resentment that saying yes has caused you. Wouldn’t it be so much easier and straightforward to just say no in the first place? We all like freebies, right? So Check out the free downloadable worksheet on Learning how to say no! 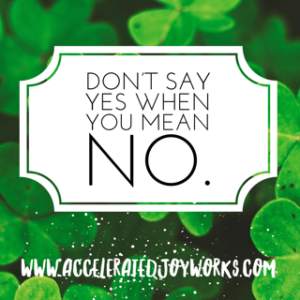 JoyWork Suggestion: When you feel a yes raising up take a deep breath, or three, and say NO! Let me know how you’re doing on the Accelerated JoyWorks Facebook page or in the comments below. This entry was posted in Uncategorized and tagged Boundaries, Communication, courage, Fear, Happiness, Healthy Relationships, Relationships, Saying No, Well-being. Bookmark the permalink. FOMO is a real thing, but you should never let it control what’s best for you. This is a great post, really powerful. Thanks for sharing! Thanks for your feedback, I’m glad you like the article. I hope you found it helpful. Oh gosh I do have a hard time saying no sometimes. It’s especially hard in work situations and with friends and loved ones. You never want to appear like you can’t handle things or hurt someones feelings. So this one is a tough one. Work situations and loved ones can be the hardest! And giving the idea that you can’t do it all is really hard for us gals! I’m so guilty of all of this – I find it really hard to say no because I’m worried about disappointing others or letting them down. I have been working on it through – because it got to the point where I was saying yes to loads of things I didn’t want to do and it was making me really miserable! The stress of over scheduling yourself with things that don’t interest you or that you are doing to please others can be crippling. I’m so glad and so proud of you and the hard work you’ve been doing. Keep going! And let me know how I can help.